Jordi Alba and Neymar struck in extra-time as Barcelona completed a league and Cup double by lifting the Copa del Rey for a 28th time after a 2-0 win over Sevilla in a fiery game that saw three red cards. Javier Mascherano's dismissal just before half-time for pulling down Kevin Gameiro put Barca on the back foot and they were further depleted when 59-goal top scorer Luis Suarez limped off early in the second period yesterday. However, they resisted Sevilla's pressure after the break and Barca's numerical disadvantage was cancelled out in stoppage time when Ever Banega saw red for chopping down Neymar. Barca dominated the extra 30 minutes, but needed just six to finally make the breakthrough when Lionel Messi's sumptuous pass picked out Alba to volley into the far corner. Neymar then slotted home a second in the dying seconds from another brilliant Messi assist after Daniel Carrico had also been dismissed for two bookable offences. "It was a great intense and exciting final," said Barcelona captain Andres Iniesta. "It was a last push for the club to complete a magnificent season." Sevilla were looking for a double of their own after winning a third consecutive Europa League by beating Liverpool 3-1 on Wednesday. However, just as in a thrilling 5-4 defeat to Barca to open the season in the European Super Cup in August, they fell just short as Luis Enrique's men claimed their fourth trophy of the season, having also won the Club World Cup in December. 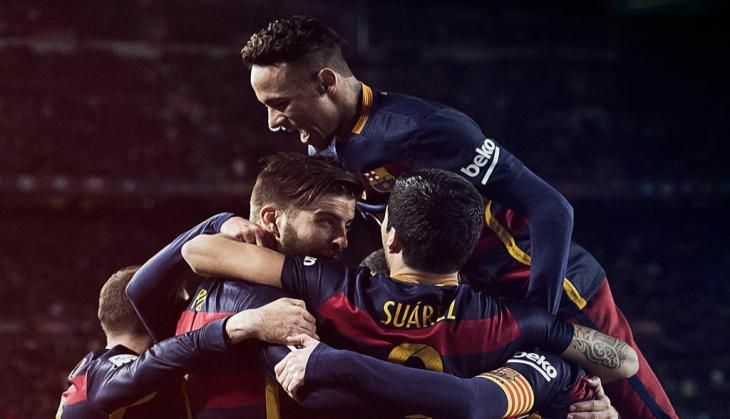 "It has been a spectacular end to the season," added Barca boss Luis Enrique. "The team has known how to compete marvellously despite the difficulties we have faced this season." And Sevilla coach Unai Emery believes his side's exertions in midweek robbed them of the energy needed to make their numerical advantage count. "We lacked freshness. If we had have been fresher we would have been able to create more chances. Barca didn't have many opportunities, but they were efficient," said Emery.